A. Requa & Co - 71 Watts St. This seems to be a combination of A. Requa & Co. and Jacob Mark, with Jacob Mark manufacturing the vault lights and Requa supplying the supporting iron framework. A. Requa & Co. was founded by Austin Requa (1805-1872). Austin Requa is described in the following terms in The Family of Requa: 1678-1898, compiled by the Rev. Amos C. Requa, Peekskill, N. Y., 1898, p. 37: "He was an iron founder in Canal Street, New York, and acquired considerable property. He moved to Morristown, N. J., where he was President of the National Bank, and elder in the First Presbyterian Church. In his will he left $1,000 to that church." Austin Requa, blacksmith, was first located at 220 Orange St., New York, in 1829. Kevin Walsh's Forgotten New York Street Necrology tells us that Orange St. ran from Chatham Street (Park Row) near Pearl St. north to Prince St. and that it was "renamed Baxter Street after Mexican War hero Lt. Col. Charles Baxter, ca. 1850." Around 1841 this address changed to 221 and 223 Canal St. It is quite possible that this address was the same location as 220 Orange (or Baxter) St. since the two locations are approximately the same. In later years the blacksmith business was called "housesmith," "iron railings" and "iron works." They moved further north to 71 Watts St. in 1854-55 and they were in business at this location as A. Requa & Co. until the middle 1860s. Austin Requa seems to have moved to Morristown, N. J. around 1859, and to have retired from the iron business by the middle 1860s. The business, however, stayed on Watts St. where it was now run by two of Requa's partners, Oliver A. Farrin (ca. 1820-1895) and Samuel McCollough (ca.1820-21-?). Now called Farrin & McCollough, the iron foundry stayed in business on Watts St. from 1865 until around 1884. Assuming this chronology, the iron supporting Jacob Mark's vault lights at 140 Duane St. was cast on Watts St. somewhere between 1854 and 1865. In 2009, then, it was approximately 150 years old. 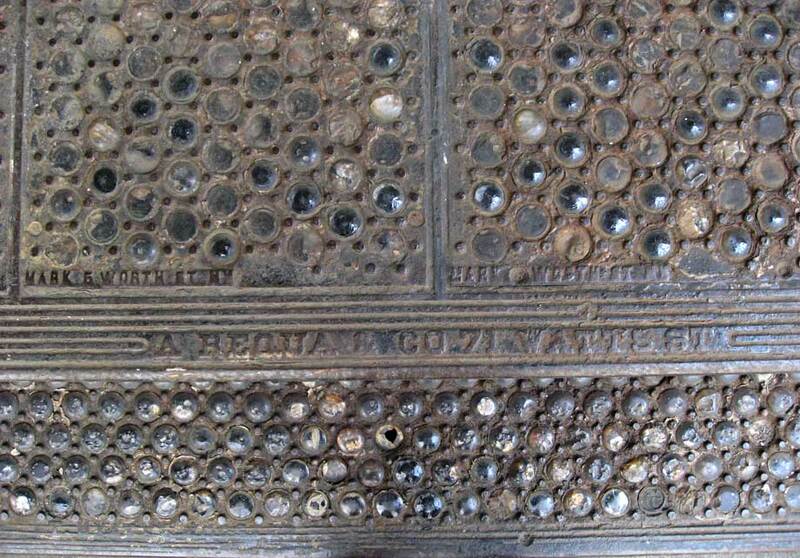 Farrin & McCollough manufactured a coal chute cover found on St. Luke's Place in the West Village. An ad in Trow's 1859 New York City Directory for A. Requa & Co. listed Requa, Farrin and McCullough as proprietors of the business, which was located at 71 Watts St.